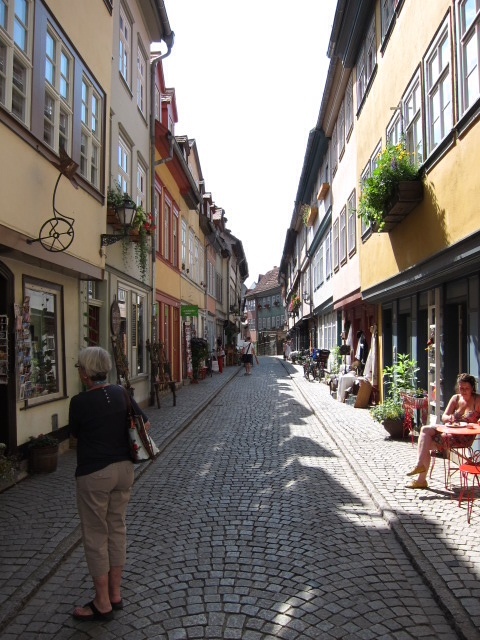 Erfurt, though relatively unsung in Britain, is one of Europe's loveliest cities. It is also the scene of one of the twentieth century's great ironies. In the narrow streets of its old centre the eye is continually drawn to medieval facades. 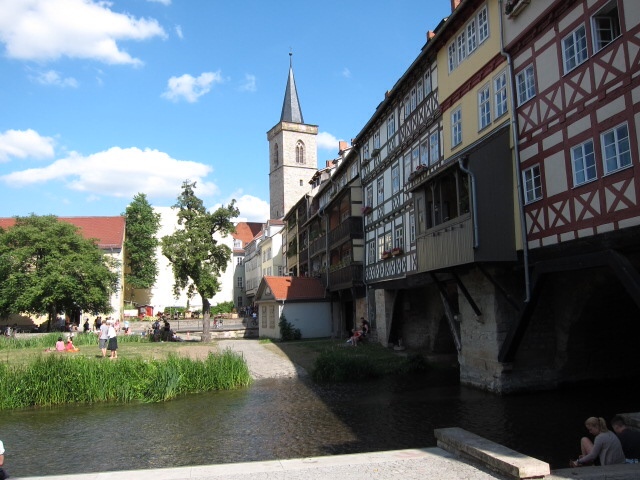 The Krämerbrücke, lined on both sides with small craft shops, is the longest of its kind in Europe. On hot summer days, children splash in the shallow waters of the Gera by its parapets, where the carts of merchants once forded the river. It owes this rich heritage largely to its position, at the centre of Germany and the crossing of trade routes from the Baltic to Venice, from Madrid to Kiev. At the conclusion of the Second World War it was briefly occupied by the Americans. After the Yalta talks its residents, given no choice in the matter and hardly any notice, found themselves part of the Communist east.Scratch the surface and you will hear stories about those days when they were citizens of the German Democratic Republic. One told me she had a group of close friends who had stuck together since school days. Then one of them married an officer of the STASI, the notorious secret police whose activities wee so brilliantly fictionalised in the movie "The Lives of Others". Fearing a slip of the tongue might land them in trouble the group cut off contact with her. She described the day in 1970 when she had tried to catch a glimpse of the then West German Chancellor as he appeared at a window on the square by the main station, there for a historic summit with his opposite number from the East. The event is commemorated in large letters on the building in question: "Willy Brandt ans Fenster". We arrived at the station from Weimar after a 15 minute train journey. 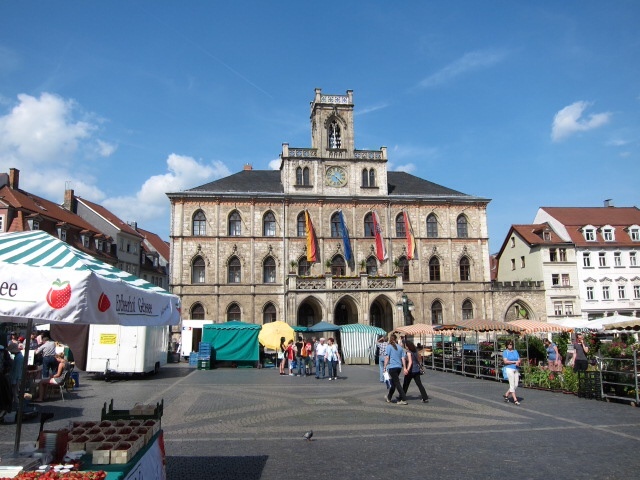 Weimar, though no less fascinating, is very different. Its name is more familiar thanks to the short lived, inflation ravaged republic, whose constitution was agreed there and later abused by Hitler. The concentration camp Buchenwald is a brooding presence just out of town, now a grim memorial. Weimar was the cradle of the Bauhaus which, like the Arts and Crafts movement, drew together all design disciplines. A fascinating museum reminds you of its continuing impact and, with the likes of Kandinsky among its guiding lights, why the Nazis effectively put paid to it. Buildings associated with the Bauhaus, including the original school, have been recognised by UNESCO as World Heritage Sites. But so have the houses, castles and parks which reflect Weimar's classical period. The town's most insistent leitmotif is the Enlightenment. JS Bach, Liszt, Schiller and Goethe, the great polymath, all lived there. The museum attached to Goethe's Baroque house., with its graceful evocative wooden staircase and the piano Mendelssohn played, illustrates his boundless curiosity through collections of everything from artworks and minerals to the skeletons of small creatures. Weimar's crowning glory, however, is the Duchess Anna Amalia library. The initial impact of its tiered Rococo Hall is like that you experience, for example, stepping for the first time into a great cathedral. Anna Amalia married Duke Ernst II Konstantin of Saxe-Weimar-Eisenach in her late teens. He died two years later, leaving her with an uncommonly long widowhood in which to fill her time. She founded the library in 1766, with the then revolutionary idea opening it not just to the upper classes but to all comers. The shelves are lined with volumes Schiller and Goethe might have borrowed - the former keen on history, the latter, who made over 2000 loans, intrigued by everything from Descartes to Humboldt's account of his South American expedition. He made over 2000 loans. In 2004 a fire destroyed around 50,000 books and damaged many others. Water from hoses cascaded though the Rococo Hall, which had to be painstakingly restored. Extraordinary expertise was deployed to rescue soaked and charred volumes. Those left soggy by the water were put in freezers and slowly thawed later, to prevent mould. Erfurt has a much less courtly atmosphere than Weimar. It is the capital of the state of Thuringia, whose many attractions remind you how much was obscured by what we once called the Iron Curtain. 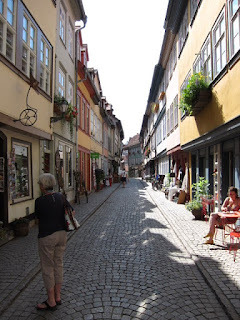 Eisenach is just one example. Dominated by Wartburg Castle where Luther translated the New Testament, it is the town where Johann Sebastian Bach was born. Next to what hay or many not have been his birthplace is a wonderful museum, where the entrance price also gets you a recital on instruments from the baroque period. Unusually, Erfurt has a great church, St Severus, next to an even greater cathedral, their closeness explained by the fact that they were originally female and male establishments. The latter brims with treasures, such as its 14th and 15th century windows, hidden in a mine during the Second World War and a lovely little altar painting by Lucas Cranach the Elder. Unlike Weimar, Erfurt is full of busy beer gardens. We dined in one - Zum Güldenen Rade in Marktstrasse - on delicious potato dumplings called Klösse, which are a local speciality. Mine were stuffed with black pudding and liver sausage and served with two sauces, one a horseradish cream. But of all Erfurt's fascinations, none is more memorable than its old synagogue, now a museum. Until a couple of decades ago it had lain concealed by surrounding buildings for over 500 years. It was built in the 11th century, but was later covered to a storehouse some after the city's Jews, blamed for the arrival of the Black Death, were massacred in a 14th century pogrom. Nearby a construction worker unearthed what he took to be an old ash tray. It led to the discovery of a staggering hoard of Jewish jewellery, coins and artefacts which are now on show there. The great irony I mentioned at the outset is that the synagogue eventually became a restaurant and dance hall. And as my guide notes, it is beyond doubt that during the darkest years of the last century, Nazis, ignorant of the building's history, caroused there.